Make the most of your holiday on the Isle of Man and take time to enjoy our unique vintage railways. Travel back in time on over 40 miles of railways that will take you on an unforgettable journey through some of the most beautiful countryside in the British Isles. Where else in the world could you find Victorian railways and tramways still operating much as they did 100 years ago? 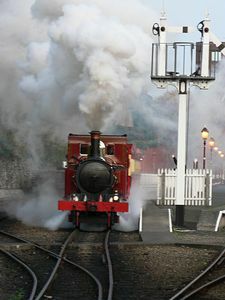 The island's railways are unique examples of Victorian and Edwardian technology which have been lovingly maintained through the years. The main railway, electric tram and bus terminals are in Douglas. The Steam Railway Station is situated at the end of North Quay, at Banks Circus and can be reached by bus. The Manx Electric Railway station (known as Derby Castle) is at the northern end of the promenade. Travel there by horse tram (they stop by request at tram stops along the promenade) or by bus. Groudle Glen Railway can be reached by alighting the Manx Electric Railway at Groudle Station and taking the short walk through the delightful Groudle Glen before reaching Lhen Coan Station. Step off the Manx Electric Railway at Laxey Station to take a tram to the Island's highest point on the Snaefell Mountain Railway. For a journey of pure nostalgia the Isle of Man Steam Railway is hard to beat. From the moment you arrive at the Victorian Douglas Station it is like stepping back in time. The working locomotives are all original dating back as far as 1873. 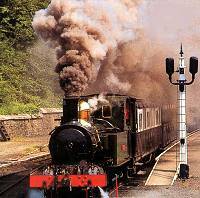 The journey is the longest narrow gauge steam route in the British Isles, fifteen and a half miles to the delightful seaside resort Port Erin. On the way you'll enjoy seeing everyday Manx life as the train steams its way through a patchwork of fields and gently rolling hills. In Port Erin take the opportunity of looking inside the Railway Museum and shop where you'll find an interesting collection of rolling stock and railway memorabilia. 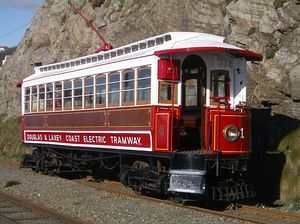 Built in 1893, the Manx Railway boasts the world's oldest regularly operating electric tram cars. The 18 mile journey from Douglas to the northern town of Ramsey is regarded as one the most scenic in the British Isles, hugging the coast for much of its route with occasional forays inland through pretty Manx villages. Sit back, relax and enjoy the view as you pass by the glens and hills and around rugged coastlines and clifftops. Along the way stop off at Laxey and explore the famous Wheel; and mines or connect with the Snaefell Mountain Railway for a ride to the summit. Alight at Ballaglass and walk one of the island's prettiest glens. From Ballajora walk to the village of Maughold. This tramway uses original rolling stock and perfectly sets the style for a relaxed exploration of the Northeast coast of the Isle of Man. Imagine walking through a magnificent leafy glen across rustic wooden bridges whilst the river beside you storms its natural path down to the mighty Irish Sea. In the background the whistle of a quaint 1896 steam engine sounds. The Groudle Railway still uses the original 2 foot gauge engine "Sea Lion" to carry its passengers along the 3/4 mile line which bursts out from the picturesque glen to the spectacular Groudle clifftops before reaching journey's end at the former polar bear and sea loin enclosures. 1996 saw centenary celebrations for this fine little railway which can be enjoyed on Sundays throughout the summer and also Wednesday evenings in July and August. Operated by a group of volunteers Groudle Glen demonstrates what hard work and enthusiasm can achieve. The Island has just one mountain - Snaefell (Norse for snow mountain). The only way to reach the 2036 foot summit if you choose not to walk is by the splendid Snaefell Mountain Railway. Built in 1895 the six original tram cars still climb the steep 1 in 12 gradient to the top. En-route take in breathtaking views of the island's largest glacial valley, the beautiful Sulby reservoir and spectacular glimpses of the north of the island over Tholt-y-Will to the sandy plains of Jurby, the sandcliffs of Bride, and on to the Point of Ayre. The Snaefell Mountain Railway may be taken from Laxey Station or from the Bungalow on the TT Course. At the peak of your journey enjoy refreshment in the Summit Café. Conceived and constructed in some seven months, back in 1895, an extra rail was laid to enable steam loco "Caledonia" to haul rail to the summit of Snaefell, when the railway was being built. For many a walk from the summit to the Bungalow before re-boarding the tram for its homeward journey to Laxey is a must and forms part of the pilgrimage to the Island for railway enthusiasts. This 'ride on' miniature railway is operated by volunteers. It runs through part of the Currahs Wildlife Park at Ballaugh on Sundays during the holiday season. The world's oldest horse tram service dates back to 1876 having operated continuously with only war-time breaks. Linking the Manx Electric Railway terminus at Derby Castle with the Sea Terminal, the line runs for nearly 2 miles along Douglas Promenade forming an important public transport function. A stud of horses provide the motive power and the tramcars are fitted with roller bearings to ease the load. Horses are bred specifically for the service and on reaching retirement graduate to the home of rest on the outskirts of Douglas, where they can be visited by the public.